IT IS is the kind of company that for years was a safe bet for investors. China City Construction is big, government-owned and focused on building basic infrastructure such as sewers. But the bet, it turns out, was not so safe after all. In November China City missed interest payments on three separate bonds, after failing to refinance its hefty debts. It is one of a growing number of victims of the government’s clean-up of the financial system, or what is known in China as the “regulatory storm”. The storm has been gathering strength for the better part of a year but its intensity over the past couple of weeks has caught many off-guard. The government wasted little time after an important Communist party meeting in October before taking on some of the riskier parts of the financial system. As a result, China’s risk-free interest rate—ie, the yield on government bonds— has shot up. Overall, it has risen by a percentage point since the start of 2017. For firms, even those closely tied to the state, the rise in borrowing costs has been even steeper. 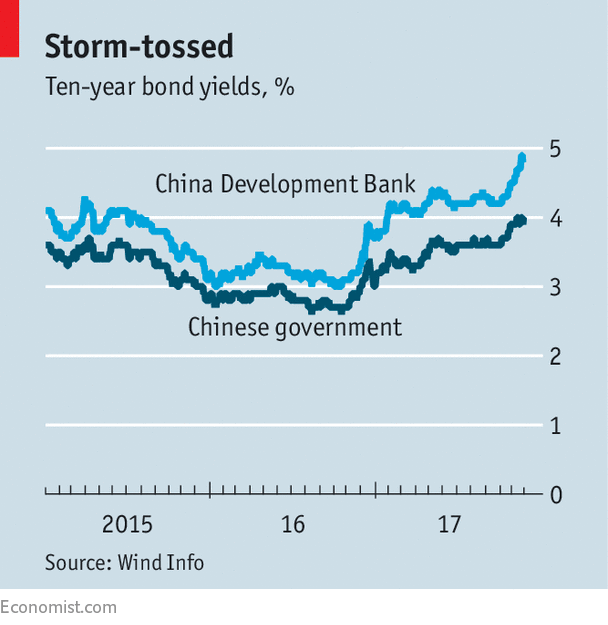 The yield on ten-year bonds issued by China Development Bank, a “policy bank” that finances state projects at home and abroad, has soared to nearly 5%, the highest in three years (see chart). Rising interest rates are partly a sign of strength. An industrial recovery has fuelled a return of inflation after years of sluggish growth, and investors are pricing in rate rises from the central bank. But the jump in yields also reflects a bout of nervousness. The CSI 300 index, which comprises shares in the biggest companies listed in China, fell by 3% on November 23rd, its largest drop in 17 months. The fear—or the hope, depending on your perspective—is that the government means business when it talks of cutting debt. Going into this year, China’s leaders said their economic priority was to control financial risks. Debt is the biggest of all, having climbed from 160% of GDP to roughly 260% over the past decade. Much of it is held off-balance-sheet by banks. So the government’s efforts have had two aims: to slow the rise in debt and to clarify the full extent of existing liabilities. Its actions, though welcomed by ratings agencies, are causing market indigestion. The latest worry for investors is the central bank’s proposal on November 17th for an overhaul of wealth-management products (WMPs), deposit-like instruments with relatively high interest rates that are sold by banks. New rules would mean banks could no longer guarantee investors against losses. They would also need to price WMPs according to their current market value and do a better job of matching the duration of their liabilities and assets. The WMP market was worth nearly 30trn yuan ($4.5trn) at its peak, or more than a third of China’s GDP. The draft rules are likely to cause it to shrink and, in so doing, to leave banks with less free cash to invest in bonds. Zhang Yu of Minsheng Securities, a local brokerage, notes that banks have until mid-2019 before the rules are enforced. But investors are not waiting. They have already started trimming their bond holdings, pushing yields higher. Another focus for the government has been internet microlenders, lightly regulated institutions that often charge exorbitant interest rates. On November 21st officials ordered a halt in licence approvals for new online lenders. They have also sounded the alarm about the property market, vowing to stop homebuyers from borrowing funds illegally. The question is how far the government will go. With the battle against risk so high on the political agenda, few think it will ease. A financial-stability committee, a powerful new body tasked with closing regulatory loopholes, held its inaugural meeting on November 8th. Zhou Xiaochuan, China’s veteran central-bank governor, has spoken on four separate occasions in the past two months about rising financial dangers. Yet there are signs of a pushback. Banks are said to be lobbying against the most stringent of the proposed WMP rules, arguing that forced asset sales will only cause more serious financial stress. The value of bonds in default in November was 9bn yuan, a single-month record for China. Officials can afford to allow their regulatory storm to rage on for now. China is still enjoying sunshine: its campaign to curb indebtedness is in its early days and yet to have much negative impact on economic growth. But the market ructions of the past couple of weeks point to rougher weather ahead. We have organized this report into three sections. 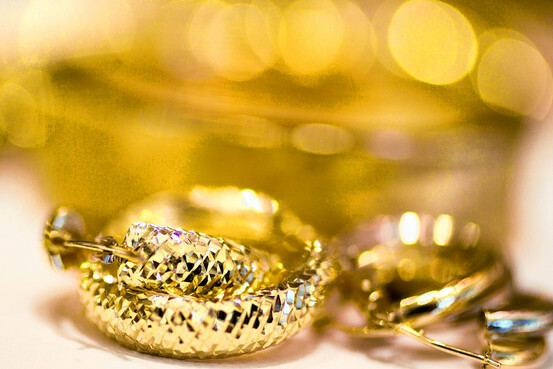 First, we examine the traditional contention that gold mining equites provide “beta-to-bullion” torque to rising gold prices. Are there tangible fundamentals supporting this relationship? Second, we document the relative performance of gold bullion and gold shares during the past two years and offer our interpretation of contributing factors. Third, we turn our attention to current prospects for gold shares. Gold’s above-ground stock (currently 187,200 metric tons) towers above annual mining production (currently 3,222 metric tons) to such a huge degree that annual mining output is a negligible factor in reigning market pricing. Further, gold’s rarity and the daunting physics of its extraction bring unyielding inelasticity to the global gold mining industry. For example, in 2001, spot gold averaged $271 and global mine production totaled 2,645 metric tons. In 2012, the gold price averaged $1,669, a 516 percent increase over 11 years, yet global mine production increased only 9 percent to 2,883 metric tons [all GFMS statistics]. We can think of very few businesses in which a decade-plus sextupling of the product price barely budges industry capacity! The point here is that during secular advances in the gold price, gold mining equites do not face headwinds of industry production responses. The chart below illustrates how annual mine production has remained fairly steady since 2001, while prices have been generally trending upward. The obvious flip side of gold share torque is the fact that this gearing works in both directions. During extended periods of gold price weakness, the investment merits of gold mining companies can become increasingly challenged. Along these lines, after spot gold’s 10-year, 657 percent gain through its intraday high of $1,921 on Sept. 6, 2011, spot gold declined 45.53 percent through its Dec. 3, 2015 intraday low of $1,046. During this four-year “correction,” the NYSE Arca Gold Miners Index (“Gold Miners Index”)[i] declined 81 percent to its low of 347.41. Along the way, the spirits and sensibilities of an entire generation of gold equity investors were sorely tested, while generalist investors simply abandoned gold miners as a relevant asset class. Of course, from such sentiment depths are often born the greatest investment opportunities. Following the lead of spot gold’s December 2015 trough, gold equities marked their ultimate low in January 2016. Then, following the lead of spot gold’s 29.59 percent surge year-to-date through July 6, 2016, the Gold Miners Index powered to a 129.51 percent year-to-date gain by Aug. 10, 2016. On the same day, one Junior Gold Miners Index[ii] reached a year-to-date gain of 167.87 percent. As is so often the case with gold shares, their post-trough sentiment inflection generated electrifying returns during the first half of 2016. Then, after consolidating summer gains in orderly fashion through the fall of 2016, the gold complex was rattled by the game-changing election of President Trump. Even so, by year-end 2016, spot gold had consolidated a calendar year gain of 8.03 percent, while the Gold Miners Index and the Junior Gold Miners Index finished the year with sterling gains of 54.57 percent and 75.28 percent, respectively. During 2017, however, the relative performance of gold bullion and gold shares has become somewhat anomalous. Through Nov. 16, 2017, the year-to-date gain for spot gold stood at 10.98 percent, versus a gain of only 8.25 percent for the Gold Miners Index and an actual decline of 1.77 percent for the Junior Gold Miners Index. Are Investors Gun-Shy Because of 2015 Declines? Figure 2: Spot Gold Price vs. Average Price-to-NAV Multiple for the 12 Senior Gold Producers in the Canaccord Gold Mining Universe (February 2009-November 2017) Source: Tony Lesiak; Canaccord Genuity. Ebullient equity markets and a range-bound gold price have constrained investor enthusiasm for gold equities during 2017. Despite significant gains during 2016, gold shares remain near historic lows in many valuation metrics. As shown in Figure 3, below, during 25 years through 2008, the ratio of the XAU Index to spot gold averaged 0.2497x but today rests at only 0.0632x. We recognize there are several legitimate factors contributing to this ratio’s decline. Component XAU companies have issued more shares, contemporary mining opportunities are increasingly challenging and gold miners are still disabusing investors of their reputation for poor capital allocation. Nonetheless, we view the 75 percent decline in relative valuation between prominent gold miners and their sole output as an investment opportunity offering compelling reversion-to-the-mean potential. Figure 3: Ratio of XAU Index-to-Spot Gold (Dec. 23, 1983 – Nov. 10, 2017) Source: Bloomberg. Further, we believe gold miners represent an effective tactical portfolio allocation to generate performance alpha during corrective periods for overextended U.S. equity averages. Since 1996, there have been two pronounced periods of inverse correlation between the S&P 500 Index and the Gold Miners Index: 1996-through-2002 and 2012-through-the-present. In the first instance, gold shares were literally left for dead as the internet bubble hit full stride through March 2000. Then, as the S&P 500 fell 52 percent, gold stocks tripled. In the current episode, the S&P 500 Index and gold shares have (somewhat counterintuitively) moved in precisely opposite directions ever since the Fed’s September 2012 announcement of QE3. During the first half of 2016, this gaping divergence finally appeared to be closing. Since the Trump election shock, gold shares have stabilized, but the S&P 500 has resumed its upward trajectory. We expect the “jaws of life” divergence between the S&P 500 and gold equity indices to close with trademark gusto in the near future. Currently, the redeployment of a portion of general U.S. equity exposure to gold shares represents a non-consensus portfolio allocation with highly compelling logic. Figure 4: S&P 500 Index [black] versus Gold Miners Index [gold] (Jan. 3, 1995–Nov. 10, 2017) Source: Bloomberg. Given contemporary apathy towards gold shares, we suspect most investors remain unaware of the significant degree to which gold shares have outperformed the S&P 500 Index during periods since 2000 when faith in U.S. financial assets has been challenged. As demonstrated in Figure 5, below, the three primary advances of gold shares during the past 17 years have generated aggregate returns which are nothing short of spectacular. Since 2000, the Gold Miners Index has posted three roughly three-year advances totaling 342.76 percent (Nov. 17, 2000–Dec. 2, 2003), 185.62 percent (May 16, 2005–March 14, 2008), and 309.74 percent (Oct. 27, 2008–Sept. 8, 2011). Coincident performances for the S&P 500 Index during these three periods were a decline of 22.01 percent, an increase of 10.50 percent, and an increase of 39.70 percent. Figure 5: Price Changes for Gold Miners Index and S&P 500 Index during Three Discrete Periods (Jan. 4, 1999–Nov. 14, 2017) Source: Bloomberg. • One of Bitcoins most notable differentiators in the crypto space is it has no central governance (unlike Ethereum, Ripple and many others). • Together we will examine how this affects Bitcoin and whether it leaves it better off or worse off compared to others in the space. • We will then look down the road to potential results of our conclusions and determine which crypto is best to put our money into. In my most recent article regarding the crypto-sphere (found here), I gave an introduction to one cryptocurrency I thought was a surefire long-term hold (XRP/Ripple), and examined how it was different from other cryptocurrencies. In this article we will examine Bitcoin, Ether and Ripple further to see how the differences between the latter and Bitcoin can help us make the best investment. As mentioned above, one of the things that makes Bitcoin so interesting is that from the get-go when it was first released and made public, it had nobody "in charge". It was completely decentralized in use and in governance. In fact, it is still unknown who made Bitcoin (or if it was one or multiple people). Recently, a SpacEx intern posted on medium his theory that it was Elon Musk, causing the Tesla (TSLA) CEO to publicly deny the claim. This is in stark contrast to Ethereum, which has a designated "founder" (Vitalik Buterin) as well as a host of other people leading various parts of the project. Additionally, there is the Enterprise Ethereum Alliance which is a group of dozens of companies ranging from start-ups to fortune 500 companies like Intel (INTC), JPMorgan (JPM) and Santander (SAN). It is interesting to note that many Bitcoin enthusiasts in the early days of Ethereum were skeptical to buy Ether due to the fact that people could control the blockchain for their own personal gain. Further venturing away from Bitcoins anarchist and "anti-bank" roots, we have Ripple, a full fledged company in charge of their own block chain system. Ripple has a team that is being paid to be accountable for the health of the system. They have a defined use case (enabling financial transactions to occur in 4 seconds and at a reduced cost) and a plan to get there. Before we proceed to see how these different organizational levels and agendas play out when forking becomes involved it is important to understand at least the basics of what a fork is. What Is A Fork Anyway? A fork (technically I am referring to a "hard-fork" here) can be thought of as a "fork in the road" for the blockchain. 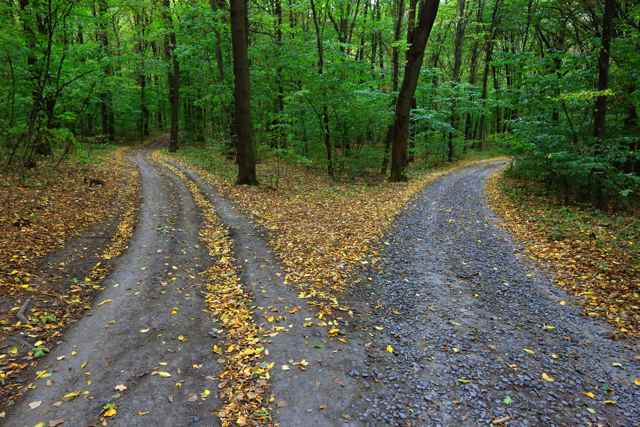 If you are traveling down a path and suddenly it diverges into two directions, you must choose which way to continue. Just like if you were walking, regardless of which path you choose the other (blockchain) still exists. It is up to you to decide which path is better based on if you think the path you have been on is better or if you want to continue down a different route instead. In the blockchain world, a fork is exactly like this, although harder to comprehend because it is completely digital. The blockchain is essentially a computer program. The same way any file can be copied, edited and then saved as a revision with the first still existing, so can a blockchain. So when someone or a group of people (whether the bitcoin mining community, Vitalik Buterin and Co., Ripple the company or whoever has a voice about a certain blockchain) decides to implement a change (generally regarded as an improvement) to their blockchain, they merely decide a date or transaction number to implement the change at, and everybody then switches to the "copied and editied" file or clone of the one that was being used up until that point. This is all simple enough, until you examine the different results that can occur with various levels of leadership. When Ripple decides to implement a change to their blockchain it is easy enough. They just push the changes to their repository hosting the files and they are basically done. In fact, Ripple just "Forked" there technology this week with a minor update from version 80.0 to 80.1. Then those participating in the network must vote on amendments and once a majority has reached consensus the change is implemented. More information on amendments can be found here. 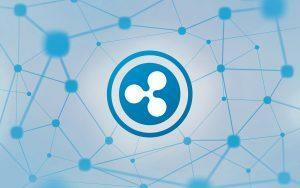 Luckily, since Ripple is a company and has relationships with their clients, they can also help to ensure everyone comes on board to implement the changes when necessary. The old blockchain can then be discarded and although it still "exists" it is basically defunct, deprecated and not maintained or utilized after that. Ethereum is quite similar to the process for Ripple. The leadership announces a fork (transaction number and approximate date) and the entire community follows suite and adopts the new duplicated block with the implemented changes. These changes are always in line with things the Enterprise Ethereum Alliance wants and in general are slowly but surely improving the platform until it achieves the stated vision from the white paper. The first time Ethereum tried to implement a hard-fork to fix some major flaws with the system, there was a resistant group of miners. They claimed that the Ethereum blockchain should never be changed and that they would continue support for the"original" Ethereum blockchain protocol. Since the majority of the community still supported the changes, the new chain retained the name "ETH" for the token and the old token/blockchain was changed to Ether Classic (or ETC). This shows some of the issues with the mining system Bitcoin is built on and Ethereum currently utilizes, with miners having a big influence on the transitions. But what about when the only people with any say are the miners? With Bitcoin forks, anyone who has been following them knows they can get messy. Many of the diehard Bitcoin fans believe the blockchain should never be altered (as those with the ETC backing). Many miners (who are ultimately mining in order to make money, with entire warehouses dedicated to the cause in Asia) also will promote whichever change they think they can get the highest returns with. Many people investing in Bitcoin today don't even understand the technology. The lack of governance, control by those with profit motivated interests (for themselves) and polarized views about what is "best" for Bitcoin cause for a lot of issues in the community. 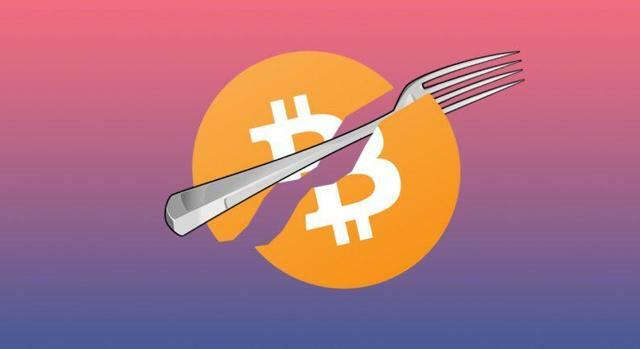 To date, Bitcoin has undergone 2 hard-forks with a 3rd highly-controversial fork indefinitely postponed at the moment. The problem with the forks is that unlike with XRP/Ripple and Ethereum/ETH, Bitcoin's community is too polarized to agree to adopt any of the changes implemented 100%. As a result of this, neither fork was able to capture the BTC name, instead opting for the offshoots "Bitcoin Cash" (BCH), "Bitcoin Gold" (BTG) and "SegWit2X" (B2X). This has lead many who have not understood Bitcoin to begin with to be unsure of which is "the real bitcoin" and a lot of confusion in the media and community. While many of the changes are good changes (like implementations to improve transaction speed or reduce mining costs) the fact that no central leadership can steer the technology in the correct direction is causing for a lot of issues for Bitcoin. The problem is that even if some of these changes are beneficial, if they do not achieve enough traction they ultimately may go away. For example, Bitcoin Classic, is shutting down and endorsing Bitcoin Cash. Another issue that all these technologies must face is increasing government scrutiny and regulation. Bitcoin will face the hardest repercussions due to its increase in adoption pressuring the government, as well as it's stance promoting an "alternative banking system" and empowering money-laundering and online drug-dealing. This week the crypto market faced a flash crash after reaching all time highs on news that Nobel Prize Winner Joseph Stiglitz called for a ban on Bitcoin. Ethereum on the other hand has many important businesses backing the technology who can lobby the government and progress the conversation on regulation in a sensible manner. Similarly, Ripple has a company that can interact with various governments and banks throughout the world to ensure regulation is inline with their agenda or adopt changes to their protocol that make the technology comply. Recently, Ripple even brought in a new board member who helped draft regulations for cryptocurrencies already. So How Does This Effect Each Going Forward? Although Bitcoin will still likely return investors money for some time to come, it is ultimately a very risk place to put your money. With uncertainty regarding what chain will ultimately be "The" bitcoin chain, and many contenders competing for the spot, it is possible the entire bitcoin craze is ended with sudden regulation by a large government or that the entire community becomes spread so thin and so polarized they all collapse. I could even see Litecoin (LTC) taking Bitcoins throne as the "store of value" system in the cryptocurrency world due to the fact it shares the same underlying code as the original bitcoin but has better leadership and so far a smaller community. Ether, while it does not really compete with Bitcoin, has much less risk due to their ongoing dialogue with governments and businesses around the world and their shift away from depending on miners. While I am not sure of the ultimate long-term value of ETH, I certainly believe it is at much less risk of becoming illegal overnight, or from polarizing the community into self-collapse. Ripple seems the strongest suited of the three here, with a company backing the technology, and the underlying protocol built by the Linux Foundation. Additionally, Ripple has always had the goal of compliance since they cater to banks and other financial institutions as opposed to trying to replace them. With their recent board member addition they have only strengthened their ability to navigate government regulation. In fact, I believe Ripple could actually benefit from regulation as it would make banks less unsure of the future legality of such a system and they would not be as hesitant to adopt the cryptocurrency XRP that can be used with Ripples product suite. In conclusion it seems to me that what was one of Bitcoin's most praised traits (complete decentralized control) may end up being it's biggest weakness as the IRS and various government entities try and grapple with the currency. I see Litecoin being the biggest to benefit from this shift as the most similar thing to the various Bitcoin iterations that exist today. Ether seems well poised to overcome any regulation due to their international dialogue with many companies and governments such as in Russia and Dubai. Ripple as mentioned above is probably the one that most stands to benefit from clear regulation as they can then proceed in recruiting banks without fear of the law interfering suddenly. With Bitcoin reaching the $10,000 mark this week for the first time, Ether and Litecoin recently hitting new highs and Ripple having a considerable run-up from .22 - .27 cents in the last few days it is important to remember that the cryptocurrency market is evolving and growing quite fast. Keeping in mind how government regulation and leadership effect these various technologies can be critical for making a good decision. With currently about 50% of the market cap of all cryptocurrencies stored in Bitcoin any major upheaval in which fork is adopted will have a huge effect on the entire crypto market. While all of these technologies will go through several more forks in their lifetime in all likelihood, some are more suited for change than others and those that are not lead well or ready to deal with regulation may suddenly find themselves in a sinking ship. The biggest thing Bitcoin has going for it is brand awareness, but the brand is becoming extremely convoluted due to all the forks being proposed, implemented or otherwise. Bitcoin suffers major drawbacks in the underlying technology when compared to Ether, Ripple and Litecoin (among others) as well as no real entity to deal with regulation compliance or act in the technologies (or users of it) best interest. Despite recent performance, the community for Bitcoin is fragmenting and many more viable candidates (whether a Bitcoin fork or not) are emerging. I believe there are too many risks to hold Bitcoin for the long term and would investigate Ether (ETH), Litecoin (LTC), or Ripple (XRP) instead. Last month, at auction, each square inch was valued at nearly $1 million – including the bummed-up, restored, and damaged parts. The question on the table: Why? But since we don’t know the answer to that question, we’ll answer another one: How come so many people have so much money? The latest GOP “tax reform” proposals raise questions, too. Though billed as a “middle-class tax cut,” the middle class gets almost nothing from the proposed plan. Instead, almost all the benefits go to: (1) business owners, and (2) the rich. And since the feds are unwilling to cut spending, the middle class ends up with about $2.2 trillion of extra debt, which it will have to reckon with eventually. We bring up the tax cut because we think it helps explain the painting. Not for nothing are Republicans and the modern Salvator Himself, Donald J. Trump, setting up the middle class for a huge bamboozle. A train ride we took last Monday – the Acela Express from Baltimore to New York – was subsidized by taxpayers from all over the country. The middle is where real work was done and real things were made, shipped, and distributed; it shows few signs of growth or prosperity. It is as though a sausage had been squeezed in the middle, driving the rich meat to the ends. In between is lean… and greasy. Every crime scene has many fingerprints on it. Most are of the innocent. An aging population, for example, is not exactly something you can do anything about. Technological innovations, too, are largely beyond public policy control. 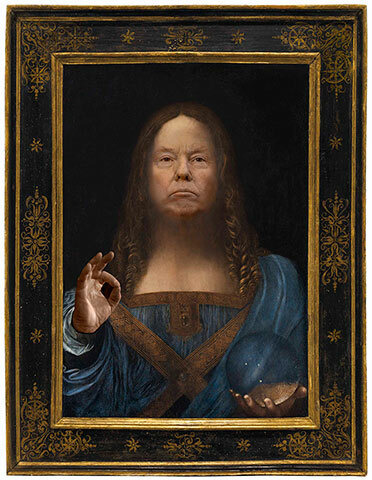 But there’s one set of fingerprints on the tax cut flimflam… the relative poverty along the Northeast Corridor… and the $450 million painting: the Deep State’s. The insiders use fake money – the post-1971 dollar – to transfer wealth and power from the people who earn it to themselves. It is as though they loaded up the train in Newark and Trenton… and shipped everything to Washington. You earn real money by making real things and providing real services. But fake money is different. You don’t earn it by adding to the world’s wealth. You get it by subtracting from it… that is, by borrowing from future output. Real money is not controlled by anyone. It is earned – freely – in win-win exchanges. Back in the 1950s and 1960s, it ended up in places like East Baltimore and Trenton because they used to make things people wanted. But fake money takes a different route. It is created by the insiders… and controlled by them. It goes where they want it to go. Money always bows to politics; often, it is completely beholden to it. In Russia, the oligarchs took government-owned property and used it to build their fortunes. In China, state-owned enterprises and favored entrepreneurs get government-backed credit to build their apartments, factories, and shopping malls. And in America, the fake money is directed to favored sectors by 73,000 pages of the Internal Revenue Code… and 81,000 pages of the Federal Register. So, it is hardly a surprise that the latest tax proposals favor the Deep State at the expense of the middle class. Readers may argue that the money “stimulates” the economy… and that it “trickles down” to the common people. If so, there is little evidence of it. As a percentage of the working-age population, fewer people have jobs today than at any time since the 1970s. Back then, the typical man had to work 900 hours to earn enough to buy a new pickup truck. Today, he has to work 1,500 hours. Central banks have increased the world’s monetary base (and their own balance sheets) by $20 trillion so far this century. This money didn’t go to the fellow in the orange vest. Instead, it went to Russian tycoons… Chinese billionaires… art collectors… hedge fund managers… and rich people on both ends of the track.